This is a corrected version of the same article published in Issue 8 of The Guardsman. For more information, please read the “Correction” notice underneath. 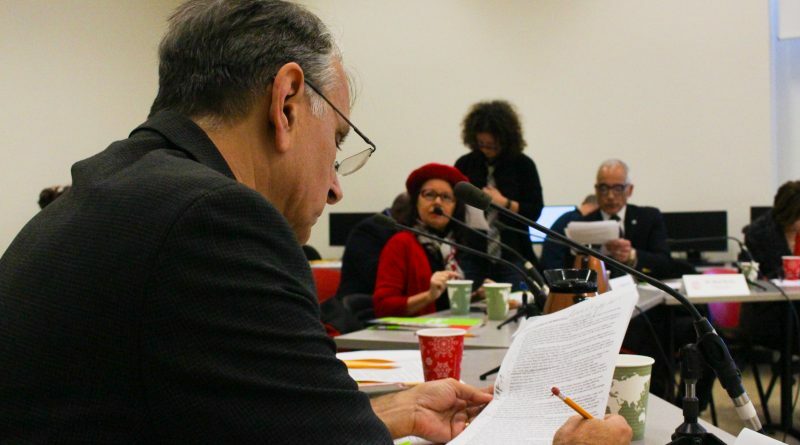 Twice in the past month, City College’s board of trustees has violated its own policy intended to improve transparency at special board meetings. The board was noncompliant with Board Policy 1.16 by only having minutes recorded at its Nov. 13 and Dec. 4 study sessions, despite the policy requiring those meetings to be audio recorded. Upon inquiry by The Guardsman, City College General Counsel Steve Bruckman confirmed the violations. “We were in compliance with the Brown Act, but we did not meet our own board policy,” said Bruckman, who represents City College legally. “I did not know that the Sunshine policy was stricter than the Brown Act […]. The board of trustees is required by law to comply with the Brown Act and California Public Records Act at minimum. But in 2009, City College created and adopted a new “Sunshine” policy, BP 1.16, which draws regulations from the San Francisco Sunshine Ordinance and holds the board to a higher standard of transparency. The violation was one of policy and not of law, and the board would not face any penalties or punishments, Bruckman said. “I’ve already had a conversation with [Chancellor Mark Rocha], and the chancellor directed me to be sure the our policies are followed in the future,” Bruckman said. Labor journalist Steve Zeltzer questioned board transparency at the Dec. 4 meeting, concerned that the board was in violation of the Brown Act for not recording the meeting and for posting a meeting notice less than a week prior. “If [the board] did not violate the actual language of the Brown Act, it certainly violated the spirit of the Brown Act,” Zeltzer later told The Guardsman. Trustee John Rizzo responded to Zeltzer’s comment at the beginning of the meeting, recalling that the board’s Sunshine policy does require meetings to be recorded. Board President Brigitte Davila, who said she would consult with Bruckman, pushed forward with the meeting to keep on track with the agenda. The meeting went unrecorded. “It’s my responsibility to ensure the the board follows its policies, and the board didn’t follow its policies, so I’m responsible for the mistake,” Bruckman later told The Guardsman. But Zeltzer said he believed trustees themselves should know their own policies like the back of their hands. “The faculty, the staff, the students and the public should be able to have proper notice so that they can participate and at least have their voice heard in the governance of City College of San Francisco,” Zeltzer said. At the unrecorded Nov. 13 meeting, Facilities Vice Chancellor Dr. Rueben Smith gave a brief presentation about City College’s current Facilities Master Plan draft, which blueprints a 10-year plan for the future of City College facilities. At the same meeting, the survey results of a $450 million to $800 million college facilities bond proposal were revealed. 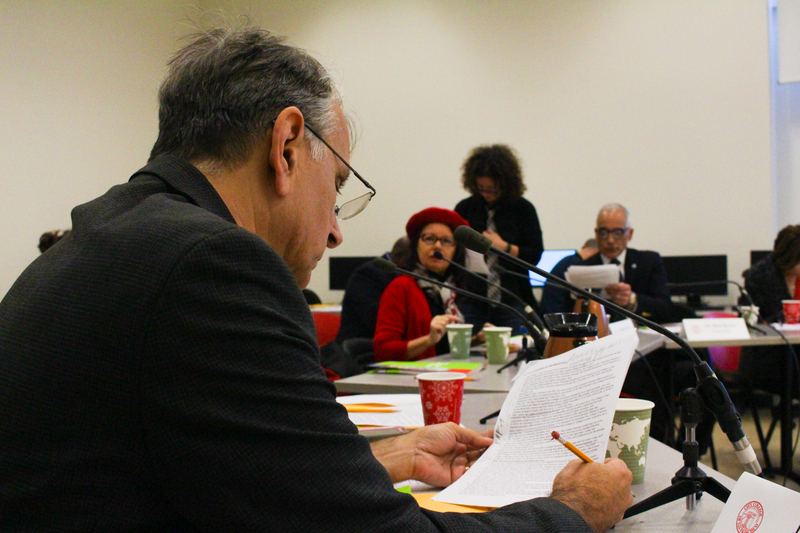 At the unrecorded Dec. 4 meeting, Rocha presented the plan to cut 400 low-enrolled courses in order to create fiscal sustainability. Vice Chancellor of Academic Affairs Tom Boegel gave a presentation about classroom size requirements, and Vice Chancellor of Finance and Administration Luther Aaberge spoke about the college budget. To read about the bond discussed on Nov. 13, read Issue 7’s “City College prepares for immense facilities bond” in Issue 7. To watch the majority of the Dec. 4 meeting, watch Steve Zeltzer’s video at https://tinyurl.com/dec4bot To read The Guardsman’s coverage of the first part of the Dec. 4 meeting, read “Classes must be cut for sustainability, chancellor says” on page 1. I published one significant error in The Guardsman’s fall 2018 Issue 8 article “CCSF’s governing board violates transparency three times.” The third act of noncompliance mentioned — that City College’s board of trustees violated Board Policy 1.16 for not giving adequate notice in its Dec. 6 special meeting — actually followed the board policy. I stated that special meetings require a notice of 72 hours, but the correct figure is 24 hours, as City College Legal Counsel Steve Bruckman had said at the Dec. 4 board study session. Although I understood the distinction between City College’s “Sunshine” policy and San Francisco’s “Sunshine” policy, I accidentally confused the City College board “Sunshine” policy with the San Francisco Sunshine Ordinance, which I’d read minutes before and has the 72-hour notice requirement. Then, I ran my conclusion by Bruckman himself, who confirmed the third violation under the belief that he had been mistaken before. However, Bruckman’s initial statement was correct, and I was wrong. For that, I apologize and promise to do better in exercising due diligence. Board President Brigitte Davila put expediency before policy and will let Bruckman take responsibility, instead of herself. John Rizzo knew the policy and she should know it as well. Of course other board members choose to follow her lead. Collusion politics?